Alexandra and Lorenzo, a delightful couple from France and Italy, fell in love with Tuscania. This charming historic town surrounded by ancient walls is only a few kilometres south of Tuscany and close to the Argentario towards Rome. Tuscania was for a long time their secret getaway until they decided to make it the venue of their wedding ceremony. The Abbazia di San Giusto for the wedding reception was incredible, adding a touch of magic to the festive event. Their guests from all over the world, the Italian countryside, the lovely weather and the lavender fields created just the right atmosphere for this joyful weekend. The Bride and Groom got ready for the ceremony in the spacious ancient rooms of the Abbazia. 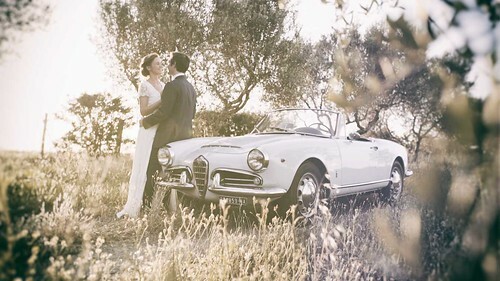 They arrived at the Cattedrale di San Giacomo in the cobbled centro storico of Tuscania in a 1962 Alfa Romeo (one of the groom’s passions). Here they found their guests and the wonderful World Spirit Orchestra, a Gospel Choir (one of the bride’s passions), already waiting for them. Musicarancio, a superb live band, set a perfect atmosphere at the reception and party with their music. They were also responsible for the installation of ambient lighting and the charming play of lights which added extra magic to the wedding celebration after sunset. The Bride and the Groom wish to thank their parents for all the love and patience that went into the preparation of the wedding. They are the very best thing that could have happened to their daughter and son. Without them nothing of all this would have been possible. Particular thanks go to Padre Gabriele for organising such an inspiring and energetic Mass in French and Italian. And very special thanks indeed go to all their guests for being there and making their wedding day truly unforgettable. Dear friends, please enjoy the video of the wedding highlights of the wonderful wedding weekend shared with Alexandra and Lorenzo in June.